The following is an edited blog post originally written by Mario Martinez Jr. Mario is a trusted OneMob adviser and a leading social seller. He has been featured in multiple publications, such as Huffington Post, Inc., and B2C. You can find his original blog post here. Visual stimulation can be found in every waking moment of our lives. Movie posters, turn signals, and even a single dead pixel on your monitor are some examples of visual stimulation that we experience daily. Anything you see that grabs your attention and incite emotions are considered visual stimulation. Why do we never fail to notice these things? The reason is simple: We prefer to process content passively. In fact, a video can be processed by our brains 60,000 times faster than words on a page! What does this have to do with sales connecting with our buyer? Everything, actually. Especially when it comes to companies using video marketing for sales. 1. Video in email leads to a 200% to 300% increase in click-through rates! 2. After seeing a product or service featured in a video, 50% of executives go looking for more information! 3. 39% of executives call a vendor after viewing a video. Until we as sales people and as sales leaders learn to be where our customers are and connect with them the way they want to be reached, truly connecting with our buyers is going to be a tough road. What is a solution? I recently spoke with Nimesh Gupta, co-founder of the video engagement platform OneMob, about the science behind connecting with buyers through social networks and email. Nimesh’s innovative company allows users to easily record personalized yet corporate-branded video messages, which can then be tracked and analyzed in customer relationship management (CRM) platforms like Salesforce. The reason that video marketing is exploding in popularity, Nimesh told me, is because video resonates with how modern buyers want to consume marketing content online. In fact, one study by the survey marketing firm Usurv found that consumers are 39% more likely to share content delivered via video than regular text, 36% more likely to comment, and 56% more likely to push the “like” button. OneMob’s success with video marketing for sales is a reminder for us all that we need to be constantly reevaluating our outreach to our buyers and constantly looking for opportunities to shake up how we do connect and sell. 1. You aren’t building trust from the first “hello”: The classic top of the sales funnel starts with lead generation and audience-building. The strength of these foundational relationships is key to your long-term success with buyers. 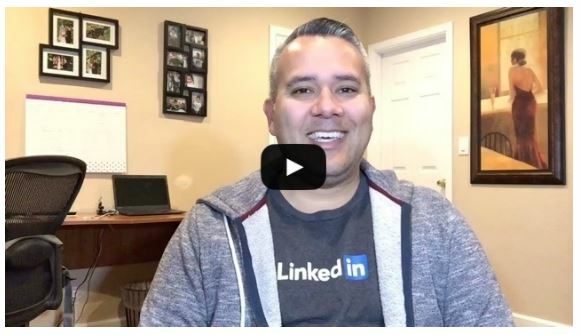 As my friend Anthony Iannarino says, “Your job is make all things unequal.” That starts with building a relationship of trust from the moment you attempt to connect with buyers for the very first time. You must remember that your modern buyers are people. People love stories. Stories create believability. And when the focus of your initial outreach is on the storytelling (instead of branded marketing jibber jabber! ), then your buyer’s brain is actually going to light up as it processes this thought-provoking story, especially one told via video. 2. You aren’t feeding your buyer to create engagement: Today’s modern buyers scroll and scan, looking for the things that catch their eye. And this behavior is the exact same methodology busy executives employ when it comes to their professional inboxes. One masterfully crafted email or social media post isn’t enough; your target audience may never see it! Instead, your goal should be to feed your buyer content via social networks that is consistent, engaging, makes them stop as they scan, speaks to how you can solve their problems, and helps them to personally get to know you. Each piece of content should draw them in a little more, piquing their curiosity and creating a series of brand impressions that stick with them over time. 3. You aren’t engaging your buyers the way they want: Video sales acceleration companies like OneMob are seeing explosive growth because they use a type of marketing content that buyers are willing and eager to consume. Indeed, the ratings firm Nielsen says that the average consumer with an internet connection watches about 206 videos every single month! And videos have the potential to dramatically increase purchasing activity. One recent study found that video in an email leads to a 200% to 300% increase in the click-through rate. This means sending a video message over a plain text email can equal higher engagement. Whether it’s videos or simply posting more frequent messages that resonate with your buyer, you need to be constantly looking at better ways to engage buyers in the way that they want. 4. You’re failing to maintain relationships after the sale: The relationship between a seller and a buyer should never end with the sale. In fact, the sale is just one more opportunity on a long continuum of opportunities to engage the buyer and leverage referrals based upon having built a bridge of trust. After a sale, you should be looking to provide educational resources, helpful guidance, and expert support. That way, when it comes time to upsell, renew, or ask for a referral, there is no question that your buyers will gladly oblige. And one more thing: If you haven’t already come to this point in your relationship, after closing your deal it now would be a good time to connect via Facebook. Your goal is to let your buyer see you in your personal life, engaging with your kids, posting personal videos, etc. That is something your competition just isn’t doing, and it’s a highly effective, simple way to stay connected “personally” after a sale. 5. You’re focusing more on differentiating your product than yourself: Most sales teams focus on selling a great product. The problem is that every sales team believes they have a great product to sell, which means the customer gets essentially the same type of sales message from your competition. Although it may seem counterintuitive, the only thing that truly sets you apart is when you can differentiate yourself from the competition. When you become the face of your company, and when you endear your buyer to you and help your buyer to trust you, you’re going to gain a huge leg-up on the competition. Remember, people buy from people they know, like, and trust. Connecting with your buyer is as much an art as a science. As video marketing for sales has shown us, even a technology that has been around for decades (since the first commercials were aired on television, to be exact!) can be reinvented and reimagined in new ways to truly resonate with your modern buyer. To show me the power of video marketing for sales, Nimesh Gupta set me up with a free trial. The results were impressive! I decided to create one for you. As you watch this OneMob video, think about how much you could improve your sales outreach if you connected with your buyer this way, every time. In my opinion it’s a GAME CHANGER for social engagement and sales prospecting. This article was written by Mario Martinez Jr. See the original post here. Applies to Enterprise, Enterprise Plus, and Trial Users. Click on the icon to connect by logging in with your Salesforce credentials. If your organization does not have the need to connect to Salesforce and wish for the icon and banner to be removed, please contact us at support@onemob.com. You must be connected to Salesforce for this feature. Auto-sync any newly created contacts on OneMob to SF. The message only appears when the user is connected to Salesforce. I.e., Blank when not connected to Salesforce. When a new contact is created, empty fields (first name, last name, etc.) will be populated by your Salesforce Contact/Lead, if values exists. This feature does not update or override any pre-existing fields. E.g., when creating a single contact or multiple contacts via CSV, if you have specified a first name, we will use that name instead of searching in Salesforce. When a CSV is uploaded with pre-existing contacts (i.e., contacts that already exists), empty fields (such as first name, last name, etc.) will be populated by your Salesforce Contact/Lead, if values exists. When a CSV is uploaded with pre-existing contacts (i.e., contacts that already exists), fields (such as first name, last name, etc.) with existing values will not be affected. Before: In the Landing Page Editor, the landing page name appeared above message box, and between the logo and contact information. Now: The name of the landing page will be displayed on the top left corner of the landing page editor, next to the “< Back” button. You may now change your landing page name via the Gear Icon > Change Name. You can now manipulate the order of additional contents you add in the landing page editor. Click + hold the thumbnail, then Drag it over to a different location. We’ve added a new sorting option! You can now sort your landing pages and email templates by time they were edited. Clicking on “View on Salesforce” will open a new window to the matching Salesforce Lead/Contact. This hyperlink is a foolproof way of confirming your OneMob activities will be tracked back to Salesforce. If you do not see this hyperlink on one or more of your contacts and would like to map your contact(s) to Salesforce, upload the email address via CSV.